Jedd's Frozen Custard sells much more than their famous namesake, but the frozen custard attraction is what separates them from the rest. This place has all the bases covered from sandwiches, desserts, breads and jams to coffee and tea. With crystal chandeliers, WiFi and glass windows bursting with treats, the space is fresh and clean. Frozen custard tastes like ice cream, except it's much smoother and creamier. The difference between the two is that frozen custard is made with extra egg yolks and cream, but less sugar. I'm not a fan of regular custard, but I was surprised at how much I loved frozen custard. The flavours offered are chocolate and vanilla, with the third flavour changing everyday. On this day, it was tropical fruit. Customers can also request what flavour they'd like to see. So far the customer flavour favourite has been chocolate mint chip. It was too hot outside for coffee but I wanted a caffeine fix so I tried the signature Affogato (top photo). 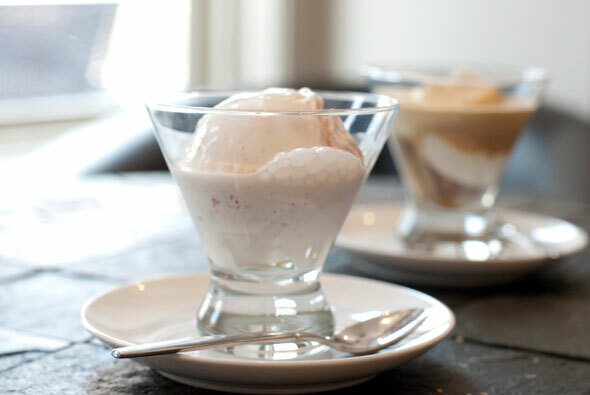 The Affogato ($5.75) is vanilla custard with two shots of espresso. The mixture is absolutely delicious, turning my coffee into a dessert that was equally creamy and refreshing. Stefania tried the tropical fruit custard ($3.25). Opened for under three months, I now understand why the employees say that customers are already hooked. People can add toppings to their custard such as Oreo bits or walnuts to make it into a sundae ($4.25). 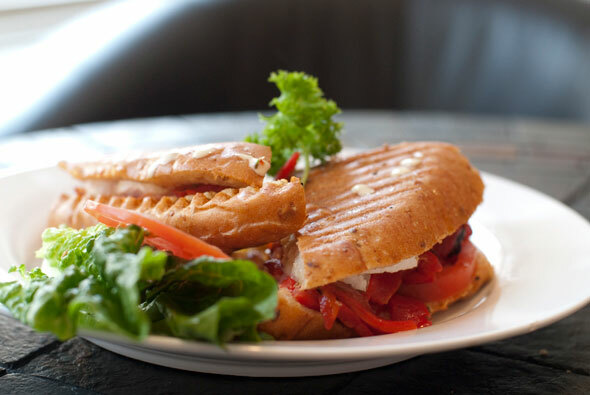 For lunch, we tried a grilled veggie sandwich ($7.25) with Brie on a ciabatta. It was delicious and gooey with lots of flavour. All sandwiches are made on the spot to ensure freshness. When it comes to dessert the options are endless. 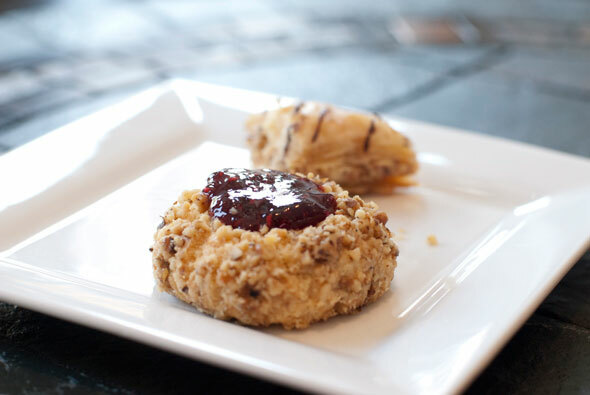 We chose a raspberry thumbprint cookie ($1.95) and chocolate almond baklava ($1.50 for two pieces). 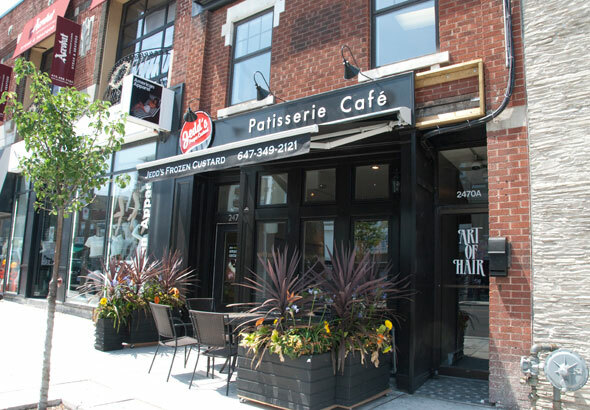 The desserts are catered in from many different locations and include choices like baked apple pie, ($4.95/slice) flourless chocolate cake, ($5.75) and dipped espresso biscotti ($1.95). Coffee and tea are also on the menu like an Americano ($2.60) or an espresso ($2.45). Their beans are from Birds & Beans . They also will feature live music performances and blended smoothies in the coming weeks. I was told the owner Jedd (who wasn't in) started this place because he tasted frozen custard on vacation and couldn't find it anywhere in Toronto. Jedd's Frozen Custard is now the only place to find the treat in the city. I know I'll be back. Jedd's Frozen Custard is open Monday to Thursday 7am - 10pm, Friday 7am - Midnight, Saturday 8am - Midnight, Sunday 9am - 10pm.